This very attractive, beige-brick apartment building, which has many gargoyles of lions on its facades, was erected in 1928 and converted to a cooperative in 1983. The 15-story building, which has a handsome rooftop watertank enclosure, has 93 apartments. 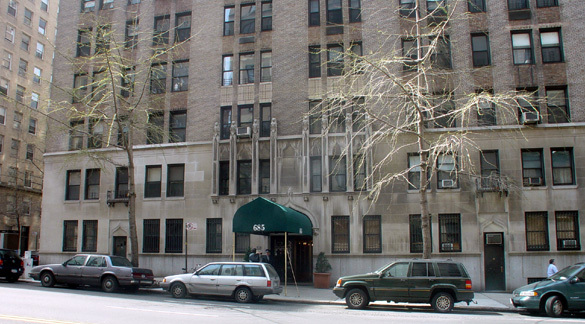 It is at 685 West End Avenue on the northwest corner at 93rd Street. 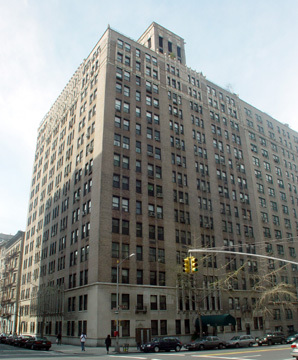 It was designed by Sugarman & Berger for the Namalc Realty Company of which Millie Claman was president and also has an address of 301-305 West 93rd Street. The building has a two-story limestone base, a doorman, sidewalk landscaping, consistent fenestration and it permits protruding air-conditioners. It has no concierge, no garage and no sundeck. "While the massing and horizontal articulation of the building reflect that of more classically-inspired neo-Renassance architecture, the facades are enhanced with stylized Gothic style ornament.....The stone base surmounts a high polished granite basement that has 'Joseph E. Gilbert/Builder/1928' inscribed at the southern end. The entrance enframement forms an ogee arch supported by masks at the imposts. It contains paired metal and glass doors with wrought-iron ornament. Flanking the entrance are four window bays with wrought-iron grilles, stone entrance enframements with blind ogee arches, and two bays at each end. The second story has six narrow denter windows flanked by projected stylized Gothic style piers supported by masks and crowned with lions holding shields....The corners of the building at the top two stories have double-height engaged colonnettes crowned with cartouches above the parapet, which is topped with a with a simple wrought-iron railing. The two-story brick roof structure has openings with metal louvers flanked by banded terra-cotta columns and topped by blind ogee arches; it is crowed by a dentiled cornice and projecting gargoyles at the corners....The original six-over-one and eight-over-one wood sash windows have been replaced with one-over-one aluminum sash....It was constructed on the site of six brick-faced rowhouses of five stories each on West End Avenue and two of four stories with basements on West 93rd Street." It is in a very attractive stretch of West End Avenue and is only a block to the east from Riverside Park and a block to the west from convenient neighborhood shopping along Broadway. Cross-town bus service and a subway station are at 96th Street and Broadway.